It was started in Moscow by a small group of Freelander 2 owners. In 2008 with owners of more diverse Land Rover models wanting to join, founder Dmitry Zakharov, renamed it the ‘Russian Land Rover Club’. It is now the biggest community of Land Rover owners in the world. There are over 50,000 registered members in the five core countries with a sprinkling of others from European nations such as France, Belgium and Lithuania. As you can imagine membership literally increases daily. They organise a number of central seasonal events with an increasing number of regional groups using the ILRC banner to run green lane trips, expeditions, social meetings and charity runs (visiting orphanages, supported by the club). 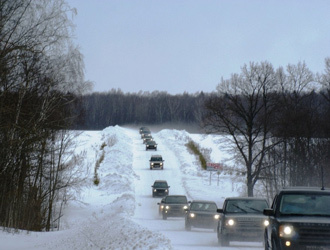 Many members are also involved with 4x4 response groups, an important resource in the bitter Russian winters. In 2012 the club celebrated its fifth anniversary, with over 70 members and their Land Rovers enjoying a four day party in a beautiful location mid-way between Moscow and St. Petersburg. The celebrations included; competitive events, ‘entertainments’ and fireworks. The biggest event to date was a celebration of the Russian holiday, Maslenitsa which marks the end of winter. Members formed a two-mile convoy of about 160 Land Rovers, the run culminated in the burning of a traditional straw Maslenitsa Doll and less traditional off-roading excursions. The club has negotiated what they call a ‘partner program’ with more than 130 specialised garages and other companies that have Land Rover related services. As well as offering discounts the partner companies sign up to giving free advice to members via a dedicated forum, a brilliant initiative. The short term ambition is to recruit more companies across their massive catchment into the partner program and then some thought will be put into publishing a club newsletter. Regional Events - Green lane trips, expeditions, social meetings and charity runs.